That is for those who really like to know such information as they feel it might influence my decision. But I want to assure all our readers that I don’t let such things influence any of my reviews. If I like it I will tell you, if I hate it I will make sure you know it ! So on with the review !! 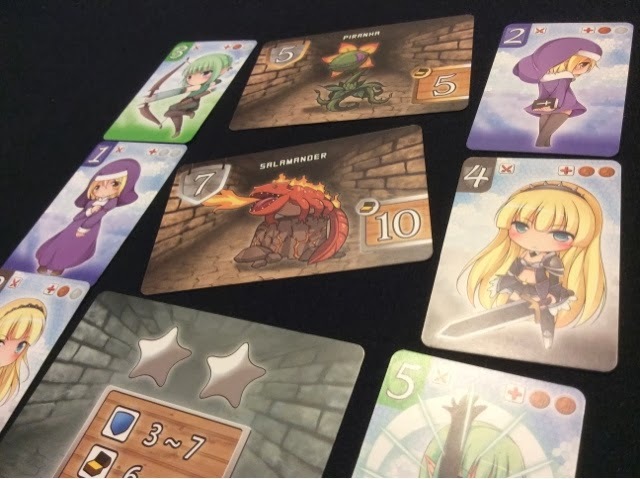 Dungeon Guilds is played over a fixed number of rounds (1 round per player). 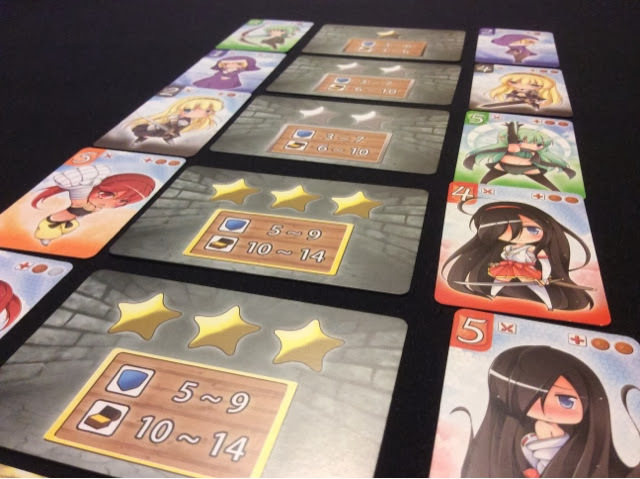 During each round, a number of dungeon room cards are drawn (also 1 room per player) and placed face down in a column from easiest (1 star) to the hardest (3 stars). 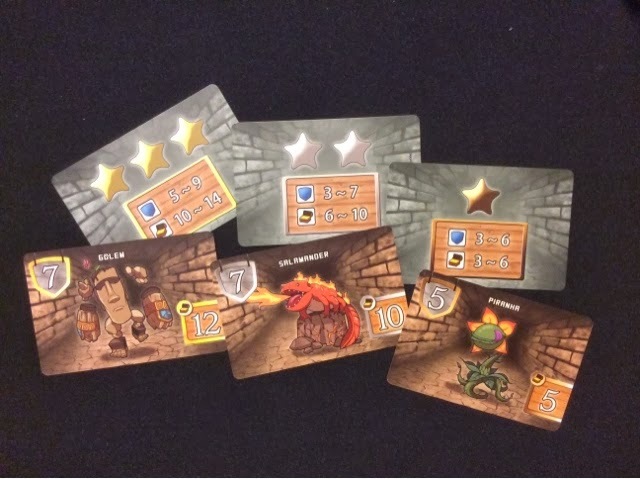 The back of the dungeon room cards will indicate two crucial information. 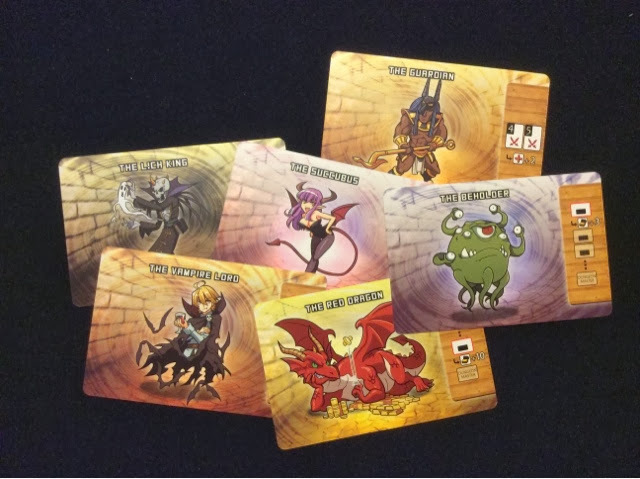 The first being the range of the monster’s hit points when the card is revealed, and also the range of how much treasure will be up for grabs by successful adventurers. Subsequently, a dungeon master is also drawn and its effects are made known to all the players. The dungeon masters’ effects range from increasing the defense and treasure in a room, to certain restrictions such as the inability to play a type of adventurer that round. 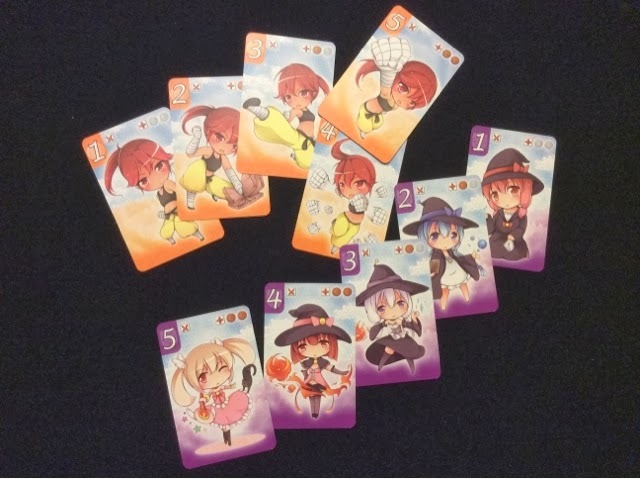 Each player has a hand of 5 adventurer cards with strength from 1-5. Starting with a predetermined start player, players will take turns placing 1 of their adventurers next to a dungeon room. This is done Settlers of Catan style where the last player gets to place 2 adventurers and play will then continue anti-clockwise. Each room must eventually be occupied by only 2 adventurers. Once this is done, the placement phase of the round is over and play will proceed to the resolution phase. Once all the players have 2 adventurers represented in the various rooms, the placement phase ends and each room is checked in sequential order – weakest to strongest – to see if the monster is defeated and thus whether its treasure will be split between the 2 adventurers. If the total value of the 2 adventurers in the room meet or exceed the monster’s hit points, then the monster is vanquished and the treasure divided evenly among the 2 adventurers (with leftovers going to the adventurer with the higher strength). If the monster overpowers the adventurers, then the room is considered to have failed and all other rooms beneath the failed room will also automatically fail. Failed rooms do not give up its treasures, but instead, any adventurers placed there must pay a penalty in coins. This is repeated each round but with new rooms and a new dungeon master. Once the stipulated number of rounds are over, the player with the most coins is the winner ! The player interaction in Dungeon Guilds is subtle but very nasty. Players may choose to co-operate and lock a room (a room is locked when the total strength of the 2 adventurers meets or exceed the maximum possible strength of a room) so that to ensure they will have treasure to split. But at the same time, other players may negotiate to mess around with the co-operating players by purposely failing a room before their locked room so that they will not get treasure but will have to pay up treasure instead. This cunning and nasty part of the game is possibly the most exciting aspect of Dungeon Guilds. Without the dungeon masters, Dungeon Guilds would possibly be quite a bland game with the same thing happening over and over again. The dungeon masters add flavor and mixes things up just enough to ensure that each round plays differently and that certain rooms seem more enticing than they normally are. I will say that the game would have benefitted more by having more dungeon masters (6 in base game plus a few more promo dungeon masters) to choose from and with more variable effects. Base Game Dungeon Masters. Beautiful Art ! Dungeon Guilds being able to play 6 is great. Being able to play 6 in a very manageable amount of time? Even better. Turns go quick and you never really get bogged down too long as once a player has 2 adventurers on the board, he/she doesn’t have anything else to do but wait till everyone is done (which would be very soon). One of the things that I enjoy in Dungeon Guilds is how you would purposely place a weak adventurer to not just perhaps fail a room, but also to make another player pay you so that they can bump you off that space. Adventurer positioning is important to success in the game and being able to manipulate not just the rooms but also the players is highly entertaining. Sometimes you can win by simply not losing and that has made quite a difference for me when it has come down to the last round. Winning isn’t everything in Dungeon Guilds, it’s sometimes a matter of how much less you lose compared to your opponents. As each room has a varied amount of treasure, it could so happen that the room you chose carried way less treasure than the room of the same type that your opponent chose. That will happen quite a bit and it can make you feel kinda sour as it was purely a matter of luck. It’s a small matter but still something that you have to be prepared to accept going in. This has happened in ALL my games. 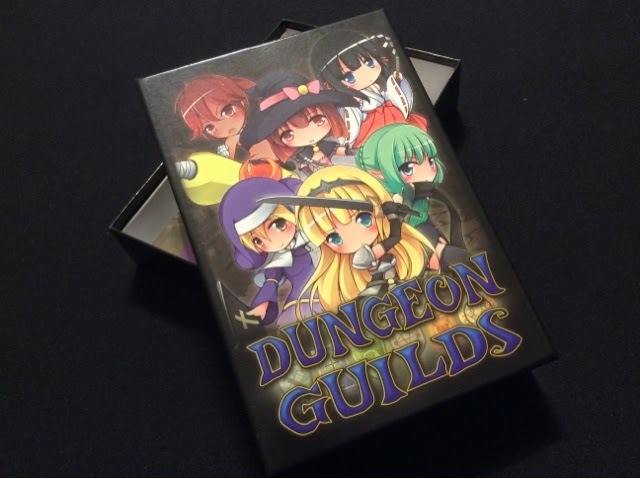 Of all my plays of Dungeon Guilds, I enjoyed every single one, except for one. And that was my first play of the game. In my first play, everyone just wanted treasure so we proceeded to overpower and lock every room. That is definitely possible depending on the room types drawn. So in our first game, there wasn’t much casualties and everything came down to luck. Terrible. You really need that someone who will look out for an opportunity to screw someone else over. So since then, I took it upon myself to be the jerk and everything changed. Yeah, so in a way, you really need to know that winning every room will make the winner just someone who is lucky. Trying to deny other players will ensure that the winner is one of skill and some luck. The nun and the warrior girl cant take our the Salamander Monster. Room Failed ! As mentioned above, there aren’t really a lot of dungeon masters. This means that possibly after awhile the game may need to lie resting on the shelf for a bit before you might want to take it out again. This really depends on you and the group but I can foresee replayability being a problem for Dungeon Guilds. There aren’t a ton of cards, so the mixture can get samey soon enough. I’ve played the game 4 times so far, and I still would play it somemore. I think after 8 plays I might need to take a rest. Haha. What I would have liked would be for some rooms to have 4 stars or ???. Rooms that have no way to be known what value it could be and thus the excitement will be cranked up a bit. I went into Dungeon Guilds not expecting anything although Tom really said so many nice things about it. I decided to go in impartial and after my first game, I came out slightly disappointed. It had potential but felt too lucky and easy. But I am glad that I stuck with it and tried a different way to approach the game. That really changed my outlook of it. When you seek avenues to mess with others, when you set yourself up (because you only have 3 cards per round, the other 2 unused are reserved for next round) on a round by round basis to have a good mix to attack or to fail a room, then you will find that the game has more depth than you initially realize. When you know that everybody winning is not as good as you losing less than everyone else, the game will start to shines in its own special way. I never go into games intentionally trying to mess with others (unless it’s a bluffing game), but for Dungeon Guilds, that’s the way it was meant to be played. If you can do that, I think you will find that the game is high on entertainment value for the time invested. True enough, it isn’t going to be nominated for the best filler game out there, nor will it blow you over with any innovative mechanics, but, its fun. All my friends have enjoyed it, we laugh a lot in our plays, and I am keeping it in my collection. No, you can’t have it.